I open my logbook. A moth flies out. Well, at least someoneis flying. Actually, thanks to my buddy Lisa losing her mind and buying an airplane, I’ve been in the air almost every week—except for those three weeks when Warbler was broken down. But flying with Lisa nowadays isn’t reallyflying. Her skill level has crossed that magic plateau every pilot-in-training experiences: One hour it looks hopeless, the next hour it all comes together, and she’s been flying like an ol’ pro ever since. So my flying with Lisa isn’t so much flying, as riding in an airplane enjoying the view. But, still, it’s not a bad way to spend a morning. And the way the FAA regs are written, I still get to log the time. But what I’m lacking is some logging of flight in my soul, and there’s only one plane to do that in: Tessie. But it’s been a bad year for poor Tess. We had that five-month engine rebuild debacle; then the prop repitch, re-repitch, re-re-repitch; then the weird oil leaks; then the leaky header tank; then the radio problems; then the stuck controls; then the broken exhaust; then the wing gas tank rebuild; then the problems with the elevator adjustment; and… Did I leave anything out? Probably. I try not to think about these things too much, and the aviation maintenance suicide prevention hot line at the NFFAis really getting tired of my calls. After coming out of a six-week-long annual in June, Tess immediately began to overheat. Badly. There was much back and forth about possible causes, and in the end, I made the decision to let a different maintenance team take a crack at the issue. Mere days out of her annual I delivered Tess to a field on the Eastern Plains of New Mexico and then waited. Of course, I’m not very good at waiting. And it’s not like I just sat idlily by. I called and emailed. And always there was an excuse for the delay. And always a promise of a new date. Finally, at the two month point the Eastern Planes guys admitted they had not even startedthe promised work. I blew a gasket, got in a car (with wife and child in tow to bring the car back home), and went to go pick up the damned airplane. When I got there and tried to start Tess, she had no oil pressure. They pulled the top plugs and the oil filter and had me swing the prop with the mags off, using the starter. This should have pumped oil. It didn’t. It looked like the oil pump, hidden deep down inside the engine case, had died. It was less than sixty hours old. I’m sure you can imagine my state of mind. As a last-ditch effort, they plugged the breather tube and applied compressed air to the oil system and we tried again. We struck oil. It was a gusher. They decided it was something called an “air lock” somewhere in the oil system, or maybe some debris. I don’t know about that, but afterward my mystery overheating disappeared. I flew Tess home without incident. Then I flew her hard the next day, just trying to overheat her. She was as good as new. The old Tessie was back, and both she and I were thirsty for adventure. I grumbled there wasn’t time. I’d have to leave in 12 hours. So I did. After crazy-fast late-night prep, Lisa and I are now south of Santa Fe with five hundred miles to go, enjoying a smooth early morning ride, and watching the temperature gauges like hawks, when I get a text on my Apple watch. But it’s not the type of text you expect to get in an airplane. At least I didn’t expect it, nor had I ever seen anything like it before. Now, for quick background on this first-time-for-me text, you need to know that after writing an article on flight plans, I got inspired and started using the modern and super-easy flight plan filing system where everything is done by computer and smart phone, a methodology which ideally suits my antisocial personality (and least when it comes to talking to authority). And a totally new-for-me option is to link my flight plan and my Spot GPS tracker. 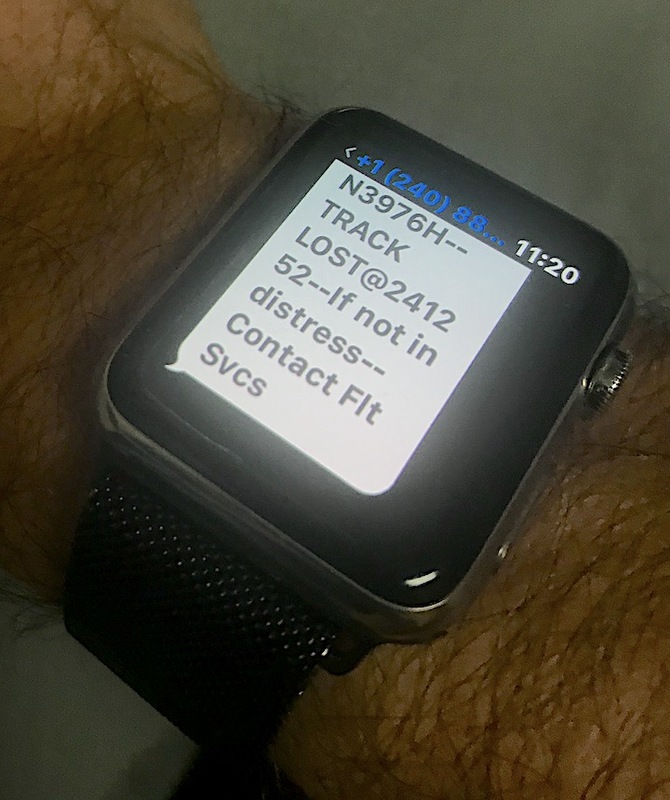 If the tracker stops tracking—i.e. moving—then rescue efforts are started right away, rather than waiting until after you’re overdue and presumed missing en route. Apparently, our tracker had stopped tracking. We dug the tracker out of the back, and sure enough, it had lost the signal. We re-booted it. No joy. The batteries were too low. To flight service we were flying along just fine one minute, and the next we had vanished. Needless to say, we needed to check in and let them know notto launch search and rescue. But I’ve gotten so used to dealing with flight service via text message, I couldn’t for the life of me remember how to contact them using something as old fashioned as a radio. I mean, seriously, I can open and close my flight plans by texting single letters and numbers to them. Why on earth couldn’t they have just texted: TRACK LOST, text (1) if you are OK, text (2) if you need help? But that wasn’t an option. In my mind’s eye I could see the slide in my Rusty Pilots PowerPoint presentation that shows the universal frequency for flight service. But my mind’s eye apparently needs bifocals; as I couldn’t focus on the long—for me—unused frequency. “You have the plane,” I told Lisa. OK, it wasn’t quite that bad, but the exchange felt awkward to me, and less professional than I envision myself. Still, they were happy to know we were still in the air, and wished us a good flight. And the rest of it was. The plane behaved. The weather behaved. Not only were we alive, but I felt alive again. Normally, coming of age tales make me want to barf. Partly because I was born old, or so says my mother, (so I never needed to come of age), and partly because they tend to be sappy-sentimental-trash. That’s why Rinker Buck’s Flight of Passage sat in the tower of need-to-read books by my bedside for a good half-year or more before I cracked it open. I bought the story of two brothers flying a Piper Cub coast-to-coast in the 60’s on a whim after reading that their very cub had been found and restored. I’m impulsive that way. But once I finally started reading it, I found I couldn’t put it down, and I wished I hadn’t put it off so long. Why? Well, for one thing it’s superbly well-written. And for another, it’s a great story from a great age in general aviation. The Buck boys made the 1966 flight from New Jersey to California in a Piper Cub that didn’t even have a radio. But everywhere they went there were airports, fuel, and “geezers” who gave them tips on flying the local area. It was wonderful, but it saddened me, too, as I realized how much has changed since then. How much the vibrancy of general aviation has faded. The three airports closest to my home base are open, but empty. They don’t sell fuel. No one is around when you land. Some of them feel as eerie as ghost towns. 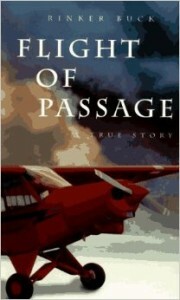 The book traces the weeklong adventures of pilot in command Kern Buck—age 16 at the time—and the author, his younger brother. The boys became an overnight media sensation during the trek, but then like so many aviation sensations, they disappeared from collective memory as quickly as they appeared. It wasn’t until three decades later that Rinker Buck wrote the story of the flight. I’m astounded at his ability to remember so much from so long ago. He captures a time a place lost to us while recounting how the flight created a lifetime bond between him and his older brother, and helped them both navigate their complex relationship with their demanding father—an old barnstormer who taught both boys to fly. The book carried me aloft and along in their noisy, drafty, vibrating cub; and the story kept me engaged. Night after night I stole some solo time after dinner to read a few pages, then later selected an alternate bedtime to fly deeper into the 351-page volume. As I came towards the end of the book, a sense of sadness overcame me, I didn’t want it to end. And last night, when I closed the cover after reading the last page, a wave of depression came over me. Now what on earth will I do with my free time? A book that good is a rare treat indeed. So “book” a flight with Flight of Passage. You won’t regret the trip.